‘Less sleep, more art’ is the slogan for Nuit Blanche in Toronto, and the free, one-night-only contemporary art festival is now in its thirteenth year. But after a long flight, and immediately being whisked off to meet city of Toronto dignitaries and Nuit Blanche associated-folk, the first part of its slogan is proving apt already. 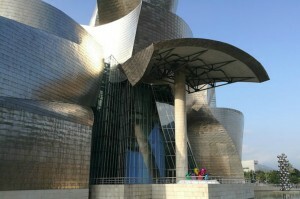 My first truly cognitive experiences of this north American city began in earnest the next day. We started early, with a walking tour through so-called graffiti alley: a great way to immerse yourself in the city’s downtown fashion district and crib a bit of local knowledge. Here, the close-knit scene’s members trade social comment and retorts amongst themselves, commenting on everything from the late Mayor Ford to whether or not doing a mural for a local conglomerate counts as selling out these days. As gentrified as this might sound – there’s even official signage telling us this is Graffiti Alley – as our guide Jason points out, at the outset, graffiti was a way to “battle, and settle scores without resorting to violence”. The act itself is often as, or more, important than the results, he says; we chat about how this reminds me of Yves Klein’s pronouncement that his paintings were but the ashes of his artwork. The important thing, the real beauty, was in the act of doing, of making the statement. And, of course, words and text in the right (or indeed wrong) hands are powerful tools. Words, it shouldn’t be forgotten, carry weight, something artists are keenly aware of. Just prior to my arrival in Toronto, artist and activist Robin Bell was busy projecting accusations surrounding Brett Kavanaugh, then Trump’s Supreme Court nominee, on to the E. Barrett Prettyman United States Courthouse (Kavanaugh’s place of business in Washington DC). These included “Brett Kavanaugh Is a Sexual Predator”; somehow though, in these strange times, the muck – indelible as it seemed – didn’t stick. Next day, on the eve of Nuit Blanche, we made the trip out to Scarborough, a district located in the eastern part of the city. More usually associated with its ethnically diverse community (and the wealth of amazing eateries those communities have brought with them) than it is with art, it feels on the fringes – geographically and otherwise. Indeed, this year’s Nuit Blanche is the first in which this part of Toronto features. 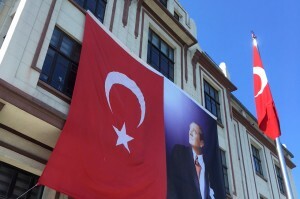 As if to acknowledge the previous lack, the event’s press launch takes place here, in a huge mall, so as to reach as many of the previously disenfranchised as possible. 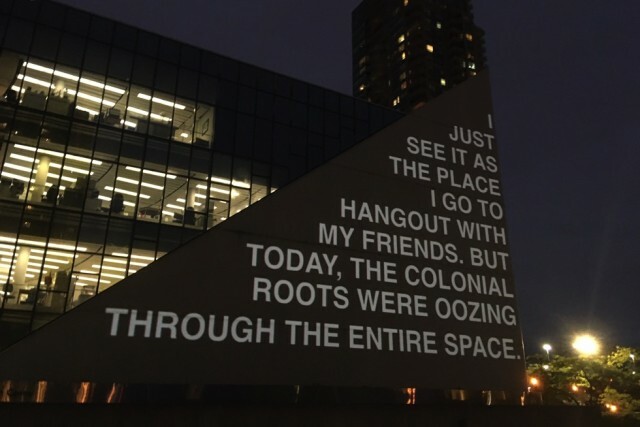 Less inflammatory than Bell’s Kavanaugh allegations, though no less of a statement, is Hiba Abdallah’s EVERYTHING I WANTED TO TELL YOU, 2018, a four-channel text installation projected directly on to Scarborough’s Civic Centre. Abdallah worked with artists and others in the community to tease out sentiments important to her collaborators, producing a set of statements, questions and observations, such as “Why are people so regional”, “It was ten stories tall. It had some seriously colonial vibes to it”, and “People are backing one another because we want to see each other win.” An immediate and potent combination of social comment and positivity, it indicates that the sense of ‘other’ traditionally felt by this community is also something that binds it. It also suggests that when those occupying the hinterlands are invited to the table, great things can happen. French-Tunisian street artist el SeeD, who had work in different parts of Toronto, is another whose practice is embedded in words and language. Speaking at the press conference, he said that he uses “Arabic calligraphy as a medium …”, asserting that “art is a tool to create bridges between people”. His multipart installation Mirrors of Babel, commissioned for the festival, proposes an inversion of the Babel legend, so that instead of peoples being separated by difference, the intent here is to foreground the reality; those “complex interactions of Indigenous and immigrant voices within Canada”. An event that lives and dies by the participation of its audience, on the night the city voted with its feet, an estimated one million flooding the streets, squares and subway past midnight. A colleague observed that at Nuit Blanche, it’s this that constitutes the artwork; people coming together across Toronto, to engage with contemporary art in a meaningful way, perhaps for the first time. If first timers liked what they found there, they could do worse than take the bus out to the recently reopened (and relocated) Museum of Contemporary Art which, says Executive Director and CEO, Heidi Reitmaier, “needs to be ground breaking”. The aim, Reitmaier stresses, is to “be a ‘listening museum’, a welcoming place where artists and their work pose provocative questions”. Coincidentally, Abdallah pops up here, too, alongside Justin Langlois on a floor dedicated to a year-long programme exploring arte util – the idea that proposes that art be useful and effective. Their work Rehearsing Disagreement, 2018, situates art and the museum as a medium by which to investigate conflict. 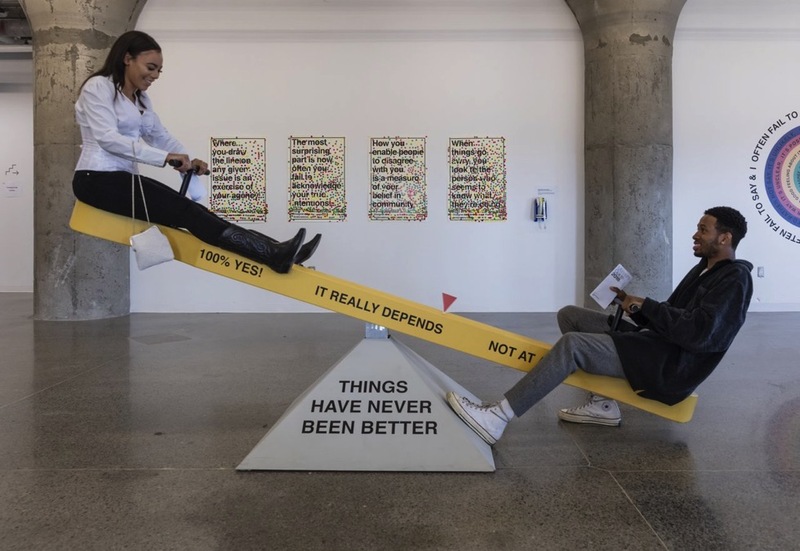 Including, among other audience-activated works, a seesaw asking participants – by actually getting on the thing – to decide whether or not “Things have never been better”, it makes for a playful, engaging and thought-provoking installation. The Art in Use changing programme includes a project by Useful Art founder Tania Bruguera next year. 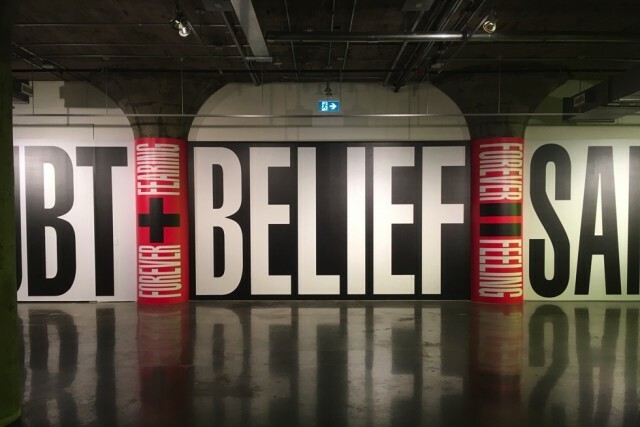 Elsewhere, across two floors of the museum is BELIEVE, displays made up of 16 artists whose works in various media (including sculpture, video, installation, film, collage, printmaking, painting, photography, animation and performance) consider belief and perception, and what we judge to be representative of “truth”. Overlooking one end of a floor, is (Untitled) Doubt + Belief, by that famed exploiter of mainstream mass communication techniques, Barbara Kruger. Made this year, and refreshingly analogue, the work mimics the billboard aesthetic of consumer culture to simply ask that we remain, or introduce an element of, circumspection into our credulity. In statement and scale, Kruger demonstrates again the power of information, and the complacency with which we too often relate to it. On my final day in Toronto, I just have time to visit the Art Gallery of Ontario (AGO) before heading to the airport. Amid the free-to-enter collection displays (including modern, contemporary, indigenous and Canadian), works by General Idea – the Toronto-based collective formed in 1969 – and Frances Stark served to prove, if proof were needed, the seductive immediacy of language. General Idea’s AIDS, 1988, sought to apply Robert Indiana’s pop aesthetic to campaign for the awareness (and against the stigma) of AIDS and HIV. Two members of the collective, Felix Partz and Jorge Zontal, died of AIDS-related illness in 1994. Frances Stark’s 2013 work Don’t Save Her, meanwhile, depicts the artist pasting up violent and misogynistic lyrics from rapper Project Pat’s song of the same name, blurring the boundaries of popular culture and the gallery, as mediated by the artist. In this age of polemics, often knee-jerk calling out and trolling, words such as mediated, and mediation, have perhaps become a little lost. But many of the works mentioned above more than make the case for text and language-inspired art eloquently. Of course, art in any form can help us to tell and make sense of stories. Sometimes, as with Abdallah’s nuanced EVERYTHING I WANTED TO TELL YOU, this is to reflect on and expose truths, while others still wield it as a weapon to engage those on the edges, or to spread messages of hope and unite communities. Whatever the cause or motivation, art continues to tell a many textured, sometimes interwoven, sometimes fragmented tale. At Nuit Blanche, and beyond, it speaks to these different narrative threads, threads that converge and reveal friction, challenges and issues, but also hints at resolution, and the commonalities we share. Art, more than ever before, must be a place where everyone’s story can be heard. Hiba Abdallah and Justin Langlois, ‘Striking a Balance – Rehearsing Disagreement’, 2018. Courtesy of Museum of Contemporary Art Toronto. Photo by Toni Hafkenscheid. Hiba Abdallah, Nuit Blanche 2018. Photo by Mike Pinnington. Barbara Kruger, Museum of Contemporary Art Toronto. Photo by Mike Pinnington.